After years of spiking violence in Tijuana, tourism officials from Baja are now promoting other areas of the state to lure people across the border. SAN DIEGO (KGTV) - Officials from the Baja Norte Office of Tourism are in San Diego, trying to convince people that it's still safe to cross the border and spend time in Tijuana and the rest of the state, despite a recent spike in murders in the city. "It's very safe to visit the state," says Secretary of Tourism Oscar Escobedo, during a recent stop at ABC 10News. Tijuana had a record number of murders in 2018, with 2,251 people killed in the city. By comparison, San Diego, which has a similar population, only had 26 murders. "I'm not downplaying what's happening," says Escobedo. "But it's outside the city." Escobedo and other officials from Tijuana have said the murders are contained to people involved in the cartels and the drug trade, and not to tourists. Still, a perception among visitors to the region has taken hold that the city isn't safe. "I just don't feel safe," says Judy Olson, who's visiting San Diego from Washington. "I'm not going to take a chance that I won't come back." "It's the violence, the gangs, the cartel," says Vera Munger, Olson's friend. "They kill people on the streets. You're just not safe." 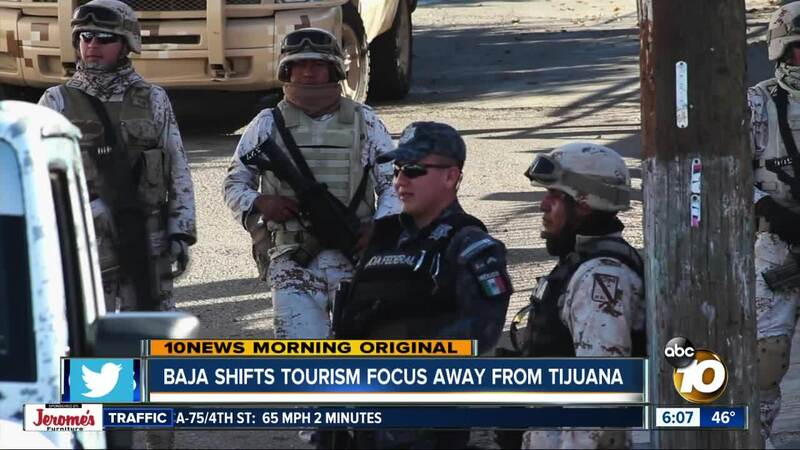 To combat that perception and keep people crossing the border, tourism officials are promoting other areas of Tijuana and Baja Norte. They're emphasizing cities like Rosarito and Ensenada. Escobedo also says the state has an emerging food scene, a great wine valley, hundreds of miles of beaches, hundreds of festivals and plenty of other activities that people can enjoy without fear. The message seems to be working. In 2018, a record 27 million people visited the region, spending around $6 billion. The state also has a 24-hour hotline, 078, that visitors can call for information, directions, assistance or learn which areas of the city to avoid. "Use common sense," says Escobedo. "Not just in Baja but wherever you travel."